The Trump administration drew back Title IX guidance on campus sexual misconduct on Friday, replacing it with “interim” guidance in the form of a question-and-answer document. U.S. Department of Education Secretary Betsy DeVos promised to rescind previous guidance earlier this month, saying that “the system established by the prior administration has failed too many students.” She declared the “era of rule by letter” to be over, pledging to create new regulation after a public comment and notice period. Last week, DeVos introduced new interim instructions to institutions while the department waits to implement a more formal rulemaking process. In a statement, the secretary said that the new guidance was an attempt to ensure that all students are treated fairly, be they the victim or the accused. The new guidance contained several important changes. One particularly controversial element of the Obama-era 2011 mandate was its call for schools to use the preponderance of evidence standard — a lower standard of proof — when adjudicating campus sexual assault. Under the ED’s new question-and- answer document, institutions may now use either a preponderance of the evidence standard or a clear and convincing evidence standard. Bisi Okubadejo, an attorney who served in the Office for Civil Rights during both the Bush and Obama administrations, said that the new policy leaves some leverage for schools to maintain the status quo, at least until ED issues more formal guidance. “I think in at least the near term, most schools are likely to implement their existing Title IX policies,” Okubadejo said. “While the rescission of the letter obviously is significant I think there still remains flexibility for schools to retain aspects of their current practices,” Okubadejo said. Sexual assault survivors argue that the changes represent a step backwards. “I think this new question-and-answer document shows that Betsy DeVos is more concerned about protecting students who are accused of sexual assault than students who are survivors,” said Alyssa Peterson, policy and advocacy coordinator at Know Your IX, a survivor and youth-led organization that empowers students to end sexual and dating violence at their schools. The new guidance removed a prior recommendation that schools complete investigations within a 60-day period. 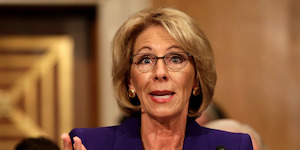 ED instead specifies that “there is no fixed time frame under which a school must complete a Title IX investigations.” Sexual assault survivors and their advocates had viewed the Office for Civil Rights’ previous call to schools to conclude investigations within a specific timeframe as a win, since without that recommendation schools could drag investigations on indefinitely if they so desired. Schools will now be allowed to resort to informal resolutions to sexual misconduct cases, including mediations between the complainant and the respondent, provided that both parties voluntarily agree to the arrangement. Institutions may also choose to allow appeals to their decisions. If so, they may either choose to allow the option of appeal to respondents alone, or to respondents and complainants equally. Some said they were disheartened but unsurprised by the new guidance. “I think anyone who has been paying attention to the Trump candidacy through to his administration is very aware that Title IX has been on the cutting block as part of any progressive Obama legacy and that there have been concerted efforts from conservative groups for quite some time now attacking the Dear Colleague letter and trying to chip away at it,” said Laura Dunn, executive director of SurvJustice, a national nonprofit that advocates for victims.